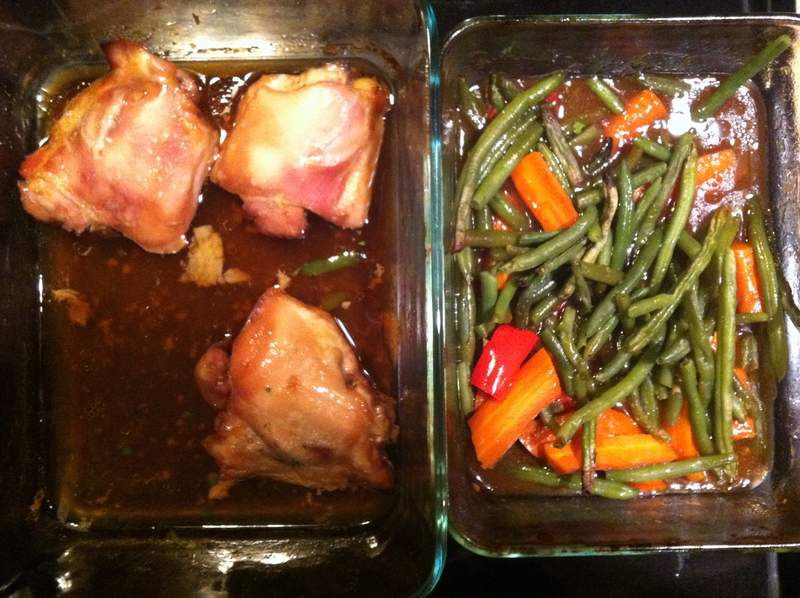 I pulled a recipe from Cooking Light for Maple-Soy Chicken Thighs and centered the entire meal around the marinade. This is a great strategy to weave the flavors of one dish into other components of your meal without complicating meal preparation. The day before you want to serve this meal, marinate the chicken and cook millet. Make the millet by boiling 2 cups water, and then adding 1/2 cup millet and 1/2 teaspoon salt. Cover and simmer until water is absorbed and millet is cooked. While the millet cooks, mix the marinade ingredients together in a glass storage container. Add the chicken (or other protein-rich food) and store in the refrigerator. 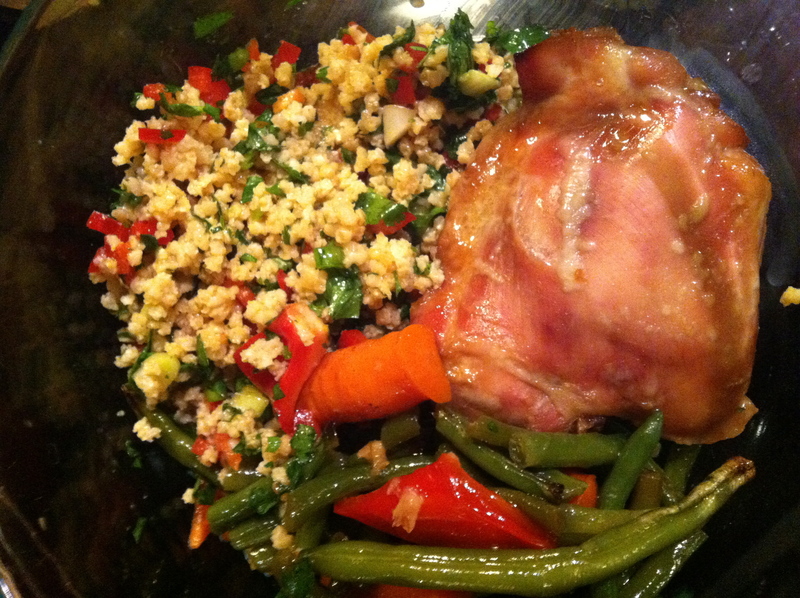 The day that you are serving this meal, bake the chicken and vegetables in the marinade and make the millet tabouli. Cut up the vegetables and place in a glass baking dish. Pour the marinade from the chicken over the vegetables. Leave just a little bit of the marinade with the chicken so that the chicken doesn’t stick to the baking dish. It is acceptable to reuse the marinade that has come in contact with raw chicken because you are going to cook the vegetables. If you would rather not use the marinade from the raw chicken, double the marinade recipe and keep some for the vegetables. Place the glass storage container with the chicken and the baking dish with the vegetables into the oven. Bake until chicken is cooked through, about 30 minutes. While the chicken and vegetables are baking, make millet tabouli. Place cooked millet in a large glass bowl. Dice red bell pepper, green onions and zucchini and add to bowl. Chop parsley and cilantro and add to bowl. Season with soy sauce/tamari, orange juice, extra virgin olive oil and ground ginger. I add a little splash of each, taste it and then add more until it tastes good. Using the same cooking method and same marinade gets Baked Chicken and Vegetables on the table in a timely manner. This was very tasty indeed! Glad you liked it! I should start a category for Dan approved!